Back during my senior year of undergrad, I got into the Ellen Degeneres show in a big way. Whenever I could catch the show, I would (generally in my pyjamas, if at all possible!). I loved Ellen's humor and her playful approach to her show, and really, she just came across as a really cool lady. Her frequent references to drinking didn't hurt either... 😉 We don't have tv currently so I haven't been able to watch Ellen's show for quite some time now, BUT recently, Ellen gave the Commencement speech at Tulane University, and the results have been posted to YouTube. Some of you may be feeling a bit low having to return back to work after the long weekend, so do yourself a favor and watch the speech below as she lauds the class of 2009. It's both funny and touching and down to earth. In essence, it is Ellen at her best. Also, I hope that when I graduate from Vandy that we get a commencement speaker half as cool. Tulane gets Ellen; Harvard has had JK Rowling... I realize Jane Austen is right out of the question, but come on, Vanderbilt! Don't let me down! Better than sitting on a cloud! It is probably no surprise that Tony and I have a shortage of book storage space in our current apartment. Our shelves overfloweth, and we have books unconventionally wedged in every which way in order to keep them off the floor. Because we rent, we can't put up wall-mounted shelves, and unfortunately we have used up all available space to place larger bookshelves. 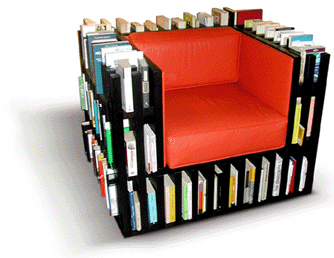 So really, the Bibliochaise (pictured right) is the PERFECT solution to our problems. Apparently you can store up to five meters of books in this thing (an interesting way of quantifying books, to be sure), and it also doubles as seating, which we always need more of! Can you imagine how great it would be to snuggle up in a chair to read, finish your book, only to grab a new one without even having to get up? This is the stuff that dreams are made of. My dream version would be the white wood pink leather combo (chocolate brown wood with lime green leather seating comes a close second). What about you? (You can permute and combine colors by clicking this link.) Alas, it appears the Bibliochaise is only available in Europe, and with a hefty £3,500 pricetag, it's probably just as well and will have to remain a dream. Tony claims he could construct such a chair of wonder for me, but for now I'll mentally tuck it away with all the other things with which to furnish my dream home. How great will this look in my home library replete with built-in bookcases (also courtesy of Tony, naturally)?